Although I doubt it will change the world, I did my part yesterday to stand up and challenge at least one bully. There has been a news story here in Quebec, about a comic by the name of Mike Ward. Mike had to pay a fine according to a judgement laid out by a human rights tribunal. 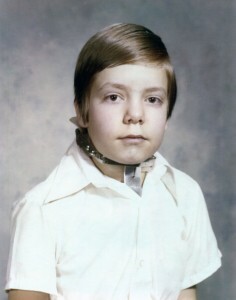 The reason for this fine was that Mr. Ward made some nasty jokes about a young disabled boy. This tribunal decision released an avalanche of social media on both sides of the “freedom of speech/don’t be an a-hole” coin, a debate I do not want to add to. What I did instead was offer myself up as a sacrificial lamb to the comic “genius” of Mr. Ward. I wonder if he’ll ever have the guts to take me up on that offer? I’m here to make you a deal Mr. Ward. I offer myself as a sacrificial lamb just for your comedy show Mr. Ward. I’m a 53 year old dwarf. I have tons of surgical scars, a crooked spine, stubby fingers, club feet, and knobby knees. Oh, and I’m really REALLY short, that’s a great thing to make fun of, and always gets the crowd laughing. And I’m a Montreal celebrity too, according to your definition, so, I am “fair game”: I have been a guest on CBC Radio and CJAD. I am also a self-published author, and a blogger. Here is my challenge: I promise you Mr. Ward, if you make fun of me in your act, I’ll never sue you, or take you to a human rights tribunal. Just leave the children alone, and donate ALL of your crowdfunding to a good cause. I freely admit, that I have always felt uncomfortable interacting with people who have intellectual disabilities. My brain knows, not all of them can understand what a dwarf is, and many of their reactions are truly innocent. But my emotions do not understand this. My dilemma is always: Is this person a jerk laughing at me, or, do they have some hidden disability that could explain things better? Something happened to me this week that I hope to never forget. My wife Bonnie and I were at the food court the other day. As we sat down to figure out what we wanted to order, I noticed a fellow drinking coffee just a few seats away. The gentleman looked at us with a big goofy grin, and I swear, he laughed out loud. Immediately my weirdo alarm bells began ringing. Bonnie and I decided on different lunch menus, and went our separate ways to order our food. A few minutes later, scanning the busy tables, the ONLY spot available, was the one with the LOL fellow. Reluctantly, I sat down and waited for Bonnie to return. Normally, I’m a friendly person, prone to starting conversations with friendly people at the drop of a hat. Not so with LOL fellow. I just sat there quietly, wondering to myself: Creep or not? You never can tell just by looking. Despite my best efforts at ignoring him, while I began unpacking my meal, I looked up several times. He looked at me, nodded and smiled. I smiled back, but still felt unsure where all this was going. Thankfully I was given a chance to justifiably ignore LOL fellow again when Bonnie arrived with her lunch tray, and we started eating and chatting. “No problem” Bonnie replied, “have one of mine”. At one point, LOL fellow had left. I breathed a sigh of relief that I would not have to fend off strange questions, or face awkward moments. Then I noticed him walking towards me, napkins in hand, with that same big grin on his face as when he randomly laughed out loud what felt like hours before. “Yes. Self-serve. Right at the counter over there” he replied, his smile growing even wider. I took the proffered napkins and said to him “Well, that’s very kind of you sir, thank you so very much!” Again, his smile grew to the size and intensity of an incredibly warm summer sun. Then he shaped his hand into the universal “fist bump” symbol, and I replied in kind as we shared a friendly fist bump. Feelings of shame washed over me as I realized how prejudiced my thoughts had been. And double shame on me, being disabled and all, fearing even the possibility that I might have to deal with a person with an intellectual disability. Talk about the universe slapping me around and waking me up. As uncomfortable as his laugh might have made me earlier on, clearly, his behavior thereafter showed he was intelligent enough to understand my words, and nice enough to act upon my needs in the nicest way possible. May I never forget the lesson I learned that day: Reserve judgment until you know for sure if a person is a creep, or, just a person with different mannerisms but a heart gold. But, here’s the problem with that “logic”: Doing your best is like building up a group of muscles, or improving a specific skill. If you don’t work at it regularly, when the time comes, when you really NEED to do your best, you won’t be able to. The following story illustrates my point. I once spent an entire summer in a cast, from my hips down to my toes, with a bar attached on the heel of each cast. I looked like a gigantic 1960’s “peace sign”, and I could not wait to get out of that heat-inducing and itchy monstrosity. But when the doctors finally took the cast off, it was so demoralizing at first. My thinking was, once this cast was gone, I would be instantly up and about. But no, a summer spent immobilized caused my leg muscles to be painfully stiff. I could not even sit up to use a wheelchair. 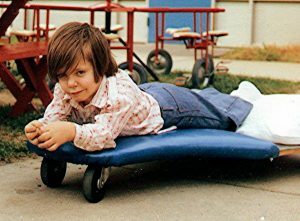 Instead they gave me “camp-cart”, which is basically a slab of wood, with four small wheels on the bottom that you lay down and move around on. With my very short arms, I could have given up and said “This is too hard for me. Besides, soon they will start my rehab to walk again, so, what’s the point of learning how to use this stupid camp-cart?” But something inside me said that I should at least try. It turned out to be one of the most critical lessons of my life: Even if you believe there is no clear benefit at that moment, giving your best effort can improve your life in unexpected and wonderful ways. As I suspected, getting my body, and the camp-cart moving along was very hard and dirty work. My hands would reach forward, slapping on the floor palm side down, and then slowly pull-pushing along. It was the toughest workout of my life, but it was much better than being stuck in a bed all day long. Soon I could roll myself around the recovery ward, attending arts and crafts workshops or going outside to play next to the sandbox. 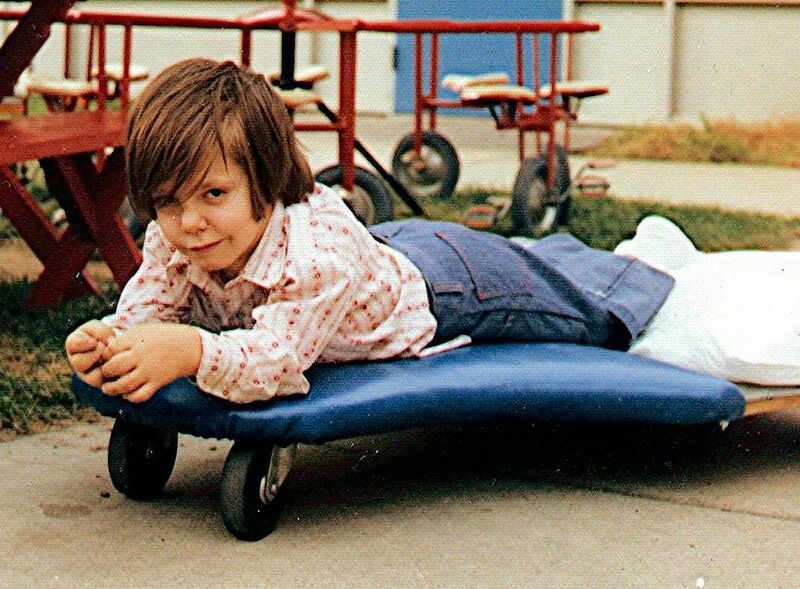 After a few weeks, I developed some very mighty forearms that were very handy later on when I started walking again: First using parallel bars, and then with crutches. If I had NEVER used the camp-cart, and built up those mighty forearms, my rehab would have been much more difficult. Although I did not understand it at the time, in the future, without my arm strength, I might never have been strong enough to live independently in a big city like Montreal, or walk with my lovely wife Bonnie, or pick up and hug my darling daughter. What else would have I missed? While I don’t quite believe in the saying “everything happens for a reason”, I do certainly feel that we can take the negative things that happen to us, and turn them into positives. But it all starts with our “best effort” muscle. This blog exists thanks to financial support from my incredible wife Bonnie, my patrons, and proceeds from my book sales. CLICK HERE to find out how YOU can contribute! 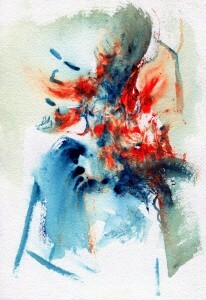 There was a time I painted abstract watercolors. I found it very relaxing, and it helped me forget the pain my dwarfism causes in just about every joint of my body. During these sessions, I noticed something familiar in my artwork as I moved my brush: A shoulder here, a rib there. I would add some simple lines to enhance what I saw. The process always mattered more to me than the end product: Losing myself in the colors that appealed to me that day, randomly spreading paint around, adding water here and there, tilting the page and letting my eye decide where the paint should dribble and flow. I let my mind and hands wander, and then later, I reflect on the end results, to see what my subconscious might be trying to say. For over ten years, almost no one except my wife Bonnie, and a very few close friends, have ever seen these paintings, mostly due to my shyness. My doodles and paintings are simply an expression of what is inside of me, and up until a year ago, not something I considered being for public consumption. This painting that I call “Pain in My Neck”, I share because I think it can serve as a reminder to us all to look beyond the surface, especially when we look at each other. Pain can be like depression in the sense that it can be invisible: Many people experience pain to a certain extent, and mostly on a temporary basis, but few understand the full impact when these things reach acute levels. Chronic and persistent pain, like depression, has a draining effect that bleeds the color and joy from our lives. As a person with a disability, one reason I hide my pain is because there are already enough visual reminders to the outside world that I’m not like most other people. I do not want to give society another reason to count me out, to exclude me, to say to themselves, “Oh, Frank can’t do this certain activity, he has too much pain”. So instead of revealing my misery, I bury my pain, and push forward, pretending that all is well. I’m not saying it’s the right thing to do, it is just how I handle things in my own life. But the main reason I hide my pain is because I refuse to let it stop me from enjoying a full life. Pain after all is just a signal from my nerve endings that tells my brain something might be wrong in some part of my body. Having experienced pain for virtually my whole life, I know there is nothing to be done except relax whenever possible, and take non-prescription pain killers when absolutely necessary. Having shared this painting, and my thoughts about it with you, I simply ask that the next time you look at another person, remember that no matter how calm they appear to be, you actually have no clue the physical or emotional pain they may be feeling on the inside. As you interact with people, remember to treat each other with gentleness and kindness, and be the cooling soothing rain that can put out those painful fires wherever you go, instead of assuming people are okay. I have a disabled friend who has been diagnosed with “fear of abandonment”. While I understand that people need to own up to their issues, society also needs own up to its role: Many psychological disorders, to varying degrees, have societal causes which also need to be addressed. For example: Over the past few decades, psychologists have recognized there is a correlation between eating disorders and the cultural ideals that glorify “thinness” or having the “perfect” body. It is not surprising how an individual can develop problems when put under such pervasive pressure. All those advertisements, where the basic message alternates between EAT THIS JUNK FOOD, and YOU’RE TOO FAT, eventually take a serious toll. Advertisers are a much bigger culprit than people want to admit, and we’re still laying most of the blame on the people who eventually and literally crack under the pressure? Seriously? In my friend’s case, the more I think about it the angrier I get at society. Disabled people often ARE radically isolated from positive, life affirming PEOPLE CONTACT. My friend does not suffer from “fear of abandonment” as much as she has noticed how stressed and lonely most of us woul d feel, when we don’t get to see the people we like and love. I also deal with these same feelings of abandonment and have for most of my life. This post was brought to you in part by my fabulous supporters at PATREON. CLICK HERE to find out more! 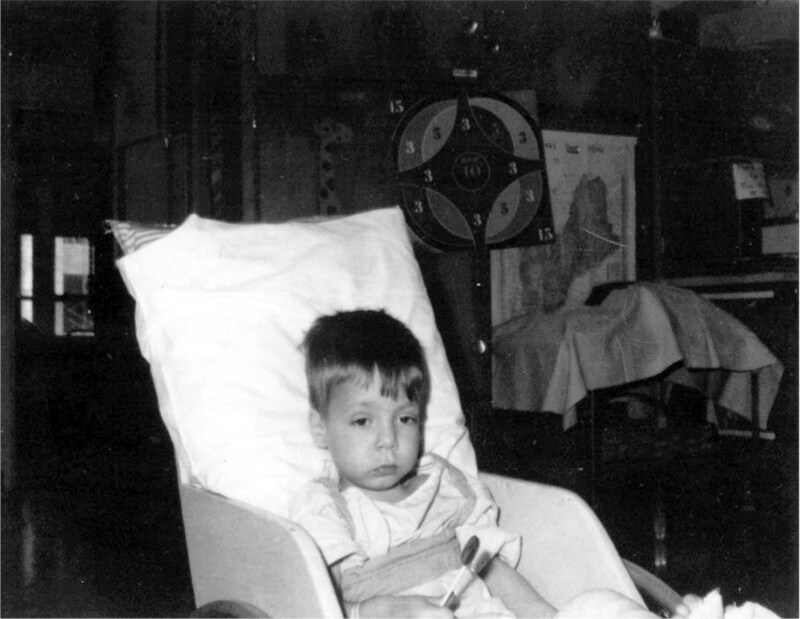 As a very young child I spent long lonely periods away from home, in the hospital for weeks and months on end. When I was seven years old, friends dumped me because, in their words, I could not “keep up” with the other kids who could run and play. And now that I’m fifty-two years old, my age and disability severely limit social gatherings I can easily attend. You bet I feel lonely and abandoned sometimes. But that is largely NOT my fault, and I KNOW it. Disabled people, if they are lucky, MIGHT have their physical needs met. On the emotional side, much less so. For example: How many visits do they get from people that love them (friends and family), every week or even every month? Outside of my relationship with my loving wife and daughter, my social solitude is REAL. Sure 10% of my loneliness I will own up to. But how the BLEEP do I get a prescription, or impose psychiatric counseling on the 90% of people in my life who call me “friend” but never call, or come by for a visit? Let’s face it: We live in a very individualistic, goal oriented, capitalistic, and competitive world, where even able-bodied people often feel isolated and lonely. Connected as we THINK we are in the virtual world, we can’t feel a hug or kiss on the cheek through the keyboard. We all need some live and direct socializing in order to maintain a healthy soul and mind. The irony is, I believe, many able-bodied people are far needier than the majority of disabled people, but their feelings of solitude get masked as they desperately run around leading their over-stimulated lives. In fact, many people with disabilities would be super happy to have a social life that was a quarter as busy as able-bodied people. Viewed in that context, which is the needier group, and who is busiest making sure they don’t feel abandoned? MY therapeutic plan for society’s side of any “fear of abandonment” diagnosis is pretty simple: If you are able-bodied, as you plan your social calendars, think long and hard on your list of friends and family. 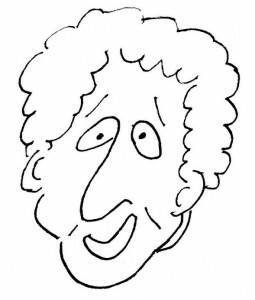 Is there someone who is isolated, disabled or elderly, that might be very happy to see you? Then call them, and GO SEE THEM! I’m sure there are many more psychological “disorders” that are at least partially caused by society’s crappy behavior. Wouldn’t it be awesome if every diagnosis took that fact into account, and held society even the tiniest bit responsible in helping us feel better? I realize that the following two words, “hard gummies”, sound mutually exclusive, contradictory, oxymoronic, improbable, and just plain WRONG when you get down to it. Stale gummies are an insult to candy lovers, especially in a household where we are pretty strict about NOT eating processed foods. If and when we eat things that are filled with ingredients that are unpronounceable, we expect, nay, DEMAND that those highly processed goodies deliver on the packaging’s promises. 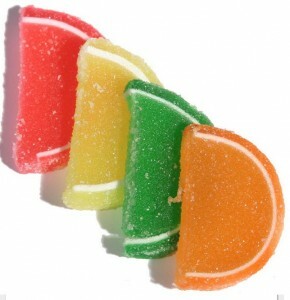 So imagine my surprise when we opened up a box of gummy “fruit slices”, and nearly broke a tooth when I tried to eat one. “WTF !?? ?” my mouth tried to say, with the candy stuck on my molars, like rock candy covered in crazy glue. My wife Bonnie agreed with me that these were no ordinary gummies, and read the ingredient list. We soon discovered the candy was filled with preservatives, artificial flavors, and artificial colors. About the only natural thing in it was the sugar. As the candy finally began to soften, I thought: If a company tricks me out of my usual healthy eating habits, with promises of artificial soft candy gummy goodness, is it really too much to ask for FRESH TASTING artificial crap? I mean, they are not pretending to create anything healthy here, and are using ingredient names that are longer than my arm! HOW IN THE NAME OF EVERYTHING ARTIFICIAL is it possible to produce STALE GUMMIES? Did they run out of preservatives like “neverhardatall” or “foreverfresh-a-zyme”? To contribute YOUR food related “Are you KIDDING ME?” story, feel free to comment on Facebook, or here in this blog! Some people say “Don’t let disability define you.” Others believe we should “let disability define us – it’s part of our identities.” Which answer is right? Language itself is symbolic: Words ARE labels, and conjure up ideas and images. Many labels are okay, if they are used as a STARTING POINT, and don’t limit our way of thinking. A child sees a chair, and might even THINK “Ha, that’s a chair”. But leave that child alone in a room with that chair, and soon it becomes a mountain, a dragon, a space ship, almost anything and everything else BUT a chair. In that way, labels like “disabled”, “blind person”, “dwarf”, can be helpful, in terms of quickly identifying what we need, and what works best for us. Without these labels, we’d never find each other on Facebook for example. But those labels are JUST THE BEGINNING of who we are, and what we can accomplish. Like a child, we can use our imaginations to become much more than the labels assigned to us. We should also use that imagination to see more in others, no matter what labels THEY assign to themselves. Labels are rarely the problem, unless the label is very rude. It’s how they are used, and how long we get stuck on them that causes more trouble. Just a thought, from this curious dwarf, father, blogger, children’s book author, who lives in the land of Montreal, and is always trying to add more interesting labels to his definition. As the father of a voracious book loving young daughter, I quickly began to realize: I will NEVER have enough money to keep up with feeding that growing and ever curious mind of hers. We read together every day, sometimes twice a day. I used the word voracious because I swear, my daughter consumes books so quickly, you can almost hear her munching on them. Out of desperation, I scoured the internet for free books: Lo and behold, I discovered Project Gutenberg. Before you could say “There’s no place like home!” I had downloaded “The Wonderful Wizard of Oz”, and we were reading along our new magical yellow brick road. While the Gutenberg website is limited to books where the copyright has expired (mostly prior to early 1930’s), you would be surprised at the classics available, complete with original illustrations, from authors like Beatrix Potter, to Robert Louis Stevenson. 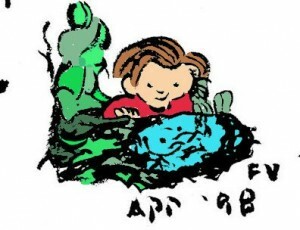 Multiple formats are supported (Epub for e-readers like Kindle and Kobo, PDF or HTML for tablets and computers), there is enough quality material to keep everyone young and old reading for at least one lifetime. There’s even an advanced search feature that allows you to search by category, author name, language, and more. Here are a few quick links to get you started, but I do have one simple request: IF you download any books from Project Gutenberg, share some of the surprises you find there. (I’m especially always looking for great illustrated children’s books). And remember share with me any great children’s books you discover! #1: Most publishers DON’T WANT KIDS BOOKS THAT RHYME. Their reasoning is: TOO DIFFICULT TO TRANSLATE. (That makes it harder for them to make more money). My thoughts on that: With attitudes like that, we would have never seen wonderful books like those written by Sandra Boynton and Shel Silverstein. #2: Literary agents mostly reject self-published authors. The reason I was given reveals that they automatically assume that SELF-PUBLISHED = LOWER QUALITY. While my book might not be best seller material, I do feel it is better than 50% of the books I’ve personally read to my own daughter. While I totally expected vast quantities of rejection letters, I was not expecting to be ruled out right off the bat. I mean, how else are children to be exposed to new poetry, if publishers are starting to turn down rhyming stories just because it makes the international market difficult to attain? Not great news by and large, BUT, I always work better when I know how steep the mountain is that I’m climbing. I actually very much dislike the word self-esteem, largely because the first part, the “self” part, implies that self-esteem develops in a vacuum. The “self” part causes too many people to believe, that when one’s esteem is low or weak, it is somehow our fault, and that the individual must take great strides to develop a stronger ego. While it is never a good thing to be overly sensitive about what people say or think about us, that does not absolve the rest of society from the crappy things it does. As I get older, I find it more and more difficult to hold myself back from speaking my mind when something stinks. I call bull crap on how many people think of this word self-esteem. If society does not like the way I look, the way I talk and walk, that’s on THEM, not ME. If I’m too short, too fat, too black, too Asian, too girly, too manly, not manly enough, not handsome enough, not pretty enough, SCREW THEM for thinking it, and for saying it. If someone laughs at my scars, my crutches, my back brace, my crooked legs, my stubby fingers, my wheelchair: THEY’RE JERKS. To be crystal clear: It is not my responsibility to fit my square mind and body, into that round hole in their minds. Show me someone with a low self-esteem, and 99% of the time, I’ll show you someone who has had moments of weakness because SOCIETY brainwashes us into thinking we all need to look the same, act the same, smell the same, and behave the same as the so-called PERFECT PEOPLE they believe we should all be. Again: BULL CRAP! Many people with low self-esteem, have had ninety-nine people who probably beat that person down to the ground, with their words and actions. How is this a “self” problem, if one feels sad about being treated so poorly? It’s not the person with low self-esteem who needs the most help, it’s those nasty ninety-nine people who need a lesson in manners. It’s those ninety-nine bullies who are the ones who need serious therapy, and lessons on how to treat people better. And across the globe, no group suffers more at the hand of society’s self-esteem gurus than people with disabilities. We get told all the time, “Oh, there there, you just need to love yourself a little more. That will fix your self-esteem problems once and for all.” BULL CRAP times one hundred! Honestly, I want to take society’s perception of our self-esteem problems, and shove it up their “where the sun don’t shine” area. Now THAT would make me, and my self-esteem feel MUCH better. In my particular case, do you REALLY believe I would have ever EVER felt bad about being a dwarf, if strangers didn’t openly stare, point and even laugh at me? My low self-esteem was somehow caused by me, myself, and I alone, all without input from society? Bull crap, bull crap, and bull crap again! By the time I reached my thirties, I finally, once and for all, believed in myself. After reading tons of books, I finally understood that I was not the problem at all, and I developed a thicker skin. All along, it was dealing with jerks that was making me sad. Once I got rid of all the nasty things people said and did to me, once I got rid of anyone and everyone who did not treat me right, I felt better. Once I ignored all the marketing that encourages us to spend and be like the beautiful pseudo important people in the media, I knew who had been at fault all along, and it was not me. It’s like being a gardener: If you want the prize vegetable to grow big and strong, you have to pull the weeds. For those of us who look different, or have disabilities, once we eliminate society’s biased and mostly negative opinions about us, we find ourselves feeling better naturally and without as much effort. It will officially be springtime soon. I wish all of us the best of luck in our beautiful gardens this summer, and getting rid of all those nasty stupid weeds!